Depicting music visually is always a tough’un – sure, you can just waft some wiggly notes, but that doesn’t really convey how the music makes the characters feel in the scene. The trappings around the music, the mood filter, are perhaps more crucial in expressing that “music is playing here.” I decided a musical interlude was needed to justify the flashback here, describing what Si’s deal is and why everyone’s wary of her. It’s all a bit Doctor Who, really – the whole “turn away for a second and your best friend spontaneously stops existing” schtick. 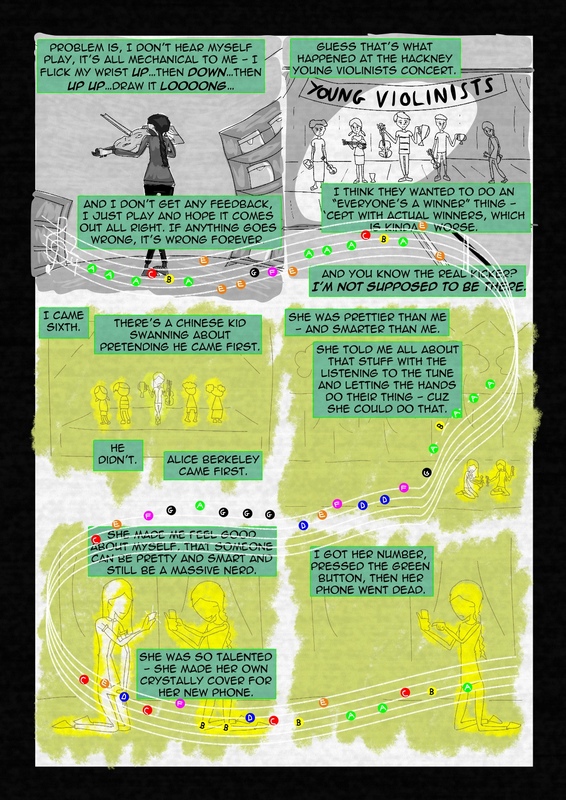 There’s not many ways to make that plot feel new and interesting, but I’ve found that telling it in comic form helps me illustrate three things at once in this scene – that Si isn’t great at the violin (rather than feeling the tune, she treats it like a quicktime button mash – which as we’ll see later may actually be good training for the situation she’ll find herself in), that it’s been long enough that her memories of her friend are starting to grow vague and indistinct (planting understandable doubt in her mind that what the world is telling her is true and she really did make Alice up), and that she’s trapped in a mental cycle of bitterness over all this (as we’ll see in the next page, her music in the present is interrupted by her thoughts of the past). That Si is a violinist was a fixture of her role even before Si coalesced as a character – going all the way back to the dual meaning of “strings” as the theoretical link between relativity and quantum physics and the literal “strings” of a violin, perhaps played in an audio player with one of those fancy wiggly visualisers turned on. If you’re interested (and if the friendly XBox buttons are throwing you off), Si is playing Niccolò Paganini’s Caprice No. 24 for solo violin. I’ve noticed a spike of new readers in the last few days, so hi everyone!